As we have for the past two years, we're planning to once again attend World Maker Faire to represent Cemetech and the calculator enthusiast community. I believe I will be joined by at least Elfprince13 and geekboy1011, and possible by Eeems and AssemblyBandit as well. We plan to have some of the same displays as in previous years: a CALCnet demonstration, CAS calculators, a gCn-connected guestbook, casemods including the Ultimate Calculator 2 and hopefully Caleb's oaken TI-82, my books, and a few calculators that visitors can test out programs and games on. We also handed out bookmarks and postcards telling people about Cemetech, its mission to teach programming and electronics, and about my books. This topic will be for planning displays and logistics among those visiting and those attending. Sounds great, the debrief from last year was most interesting! What are the plans for the display from a visual standpoint? Will there be any cool signs or other paraphernalia to lure people in? 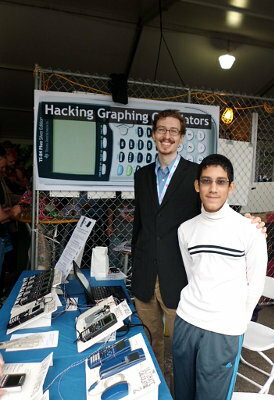 We have a huge banner with a calculator on it (visible in the photograph below from 2012). Geekboy and I have been discussing making displays out of wood and plexiglass that if completed will look a great deal more professional than the foamcore displays. I think we are using the poster from last year. I have no idea if Omnimaga will be making a poster or what not. It is an idea but has to be hashed out still. I know for the displays I would like to move away from the poster board and move towards a dark stained wood with stenciled letters and plexiglass covers for the demos that should not be touched. This of course needs to be talked about to decide which displays I have to design with covers in mind. As well as actually get a set list of displays that we are putting up. I felt the cas calculator stand was rather lackluster? The only people that were really interested in it were the teachers. While they are important maybe a smaller display for them might be in order if we do not bring them out as needed? I want to come up with a better setup for the gaming / test demo calculators I personally felt having them tied down to the display made the display get congested and such and really should be on the side instead of the middle like it was last year. rebuttles/(dis)agreements/thoughts? My only real gripe about maker fair last year was that the table did not really have a flow to it and during the busy hours it was hard to talk to people and to keep the truly interested focused and the people there just cause of the novelty entertained with out being in the way. Sounds very impressive, cant wait for pictures! When is the fair may i ask? (How much prep time do you have?). Is there anything that us international users can help with? What kind of games/demo's do you plan on running? The fair is the weekend of the 20th of September. As for help currently I do not think so? Shy of monetary help for supplies which me and KermM should have covered (Iirc he offered to help costs). It's really just me taking the time to make it happen. As for demos we just load the test calculators with a bunch of games/demos and lock them into DCS for ease of access people just load what they think is cool and we have them exit the game when they are done. Rather simple and has seemed to work well enough last year and presumably the year before. Good to have a strong lead-in to ensure that everything is checked off. I wonder how many people will think that all of the calcs are 'touch screen' ? In any case, looking forward to progress on the displays and such. The fair is the weekend of the 20th of September. Nice! World Maker Faire coincides with my birthday - Shame I can't be there. Given that arduino and Raspberry Pi are very popular these days, perhaps people at the Faire might want to see some sort of crossover between the said microcontrollers and TI calcs? That would be pretty nifty and not too hard to pull off. We already do that an arduino is what bridges the calculator to the internet for the gcn protocol! We need a proper stand for the sign this time around. And possibly a tent. Gahhh, I want to be there. Where is it at again, and when? I know I can not supply a tent Eeems and I both will have a handful to carry there. A stand for the sign might be make able though. Question though seeing as another Omnimaga administrator is coming if we were to spend the time make up a new sign to hand that has both of us on it would anybody be opposed? Both of us as in Omnimaga and Cemetech? In the past we've avoided mentioning Cemetech on our giant poster (just on the bookmarks) to avoid diluting our message of "calculators = great way to learn hacking/programming". If we stuck with that, then the existing giant Calculator Hacking poster would probably still do the trick. If we wanted to start advertising Cemetech and Omnimaga more, we could discuss how that could be best done instead, I think. I'd like to have my books there hanging out on the table again, but that's not the kind of display we need to make. One thing I always forget until the last minute is the vertical board that describes the different exhibits on the table in a sentence or two, so let's not forget to address that at some point. Finally, does the "Audio Booth" entry there cover both mobileTunes and floppyTunes sorts of music? Hmm that vertical board I will make sure is not forgotten this year! And yes I was thinking of mixing the two together into a single display board. And just flip a switch for the appropriate output device. I should be able to make that a fully functional all included display. Which is the hope. Ok so I know these will have space on the table. Anything else we want put together? If i am remembering correctly those were the big hits last year for both attention grabbing. As well as getting into some cool conversations. That sounds like the proper set of minimum components to me. I would recommend something that shows off Cemetech's non-calculator side, like something computer- or microcontrollers related, but the Faire is already going to be completely saturated with Arduino and ATmega-based hardware. How difficult would it be to set up a mini party mode 2? What about your nifty GPS stuff? It would be cool if you could record a video on one of your bus rides to work of the various data changing and have that for display as well, showing how well it works? There are 251 users online: 14 members and 237 guests. © Copyright 2000-2019 Cemetech & Christopher Mitchell :: Page Execution Time: 0.310191 seconds.